A stunning, beautifully presented gift that will both please and pamper the ladies in your life. 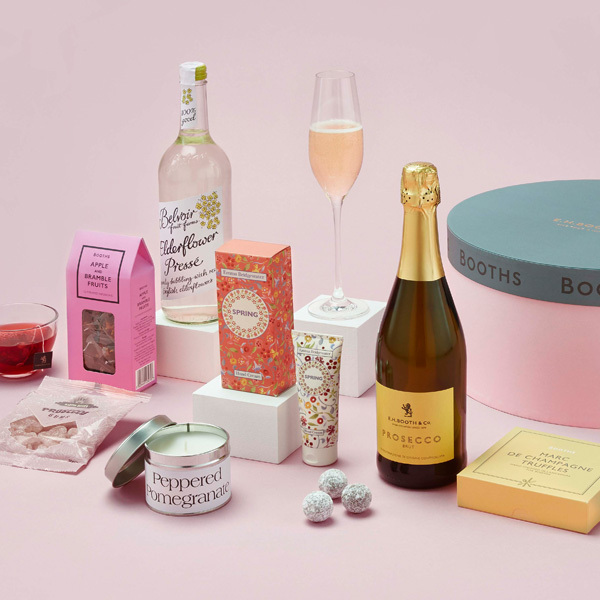 Within this hat box you’ll discover a bottle of our own Booths Processco and elderflower sparkling pressé together with Champagne truffles and our moreish prosecco gums. For additional pampering we’ve added a scented peppered pomegranate candle and Emma Bridgewater hand cream with notes of red berries, roses and geranium. A gift she’s guaranteed to love.